Out with the old and in with the new! It is amazing what organizing and adding newness to your craft space can do for one’s soul! I know, we all do not have the luxury to have a craft room. At this moment, I am fortunate to have a spare bedroom where I can work on projects. It does, however, get messy (as all craft spaces do) and I am constantly looking for ways to organize and find ways to utilize available surface areas. 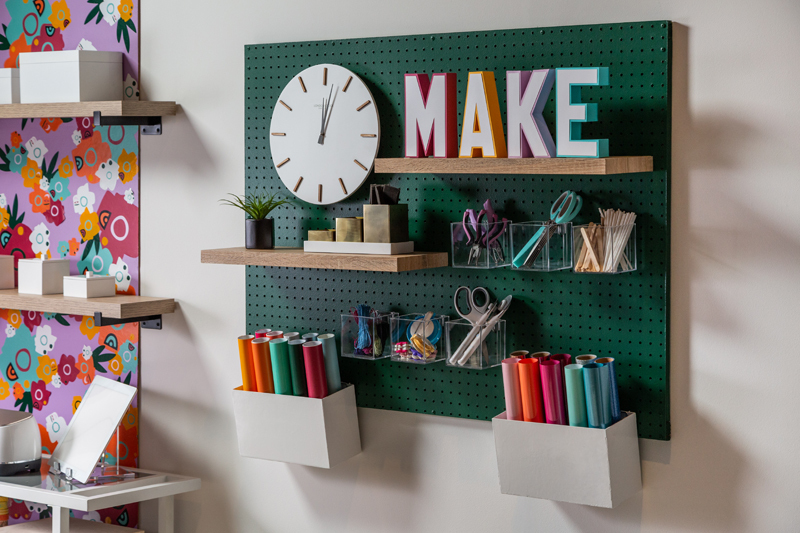 When considering an update to my room, I broke down the space into three areas: my craft table/desk, my pegboard, and my craft organization cart. Let’s start with projects to help organize my craft table/desk. This project has quickly become one of my favorites. 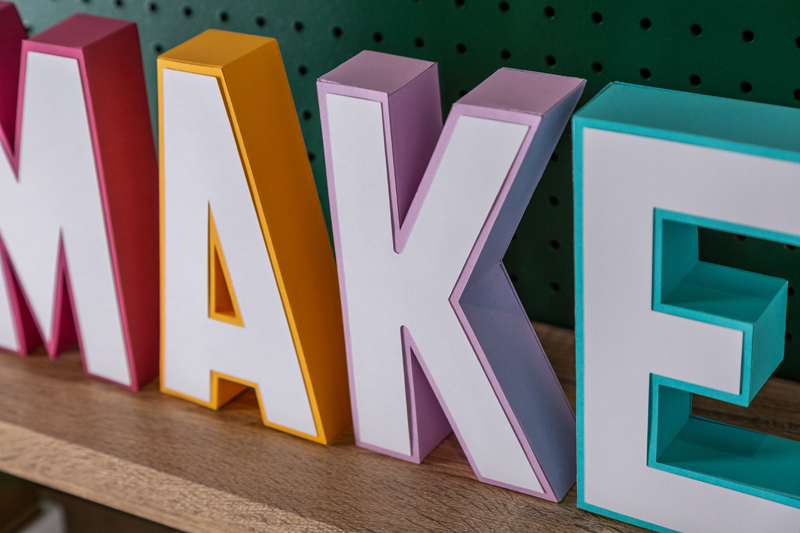 It is one made using my Maker for my Maker–how cool is that? After cutting out the pieces of Basswood using the Knife Blade, I went back-and-forth trying to decide whether or not to paint the entire organizer or just parts of it. But, after painting a few of the notches aqua, I realized I loved the combination of the natural wood color with just the hint of color. 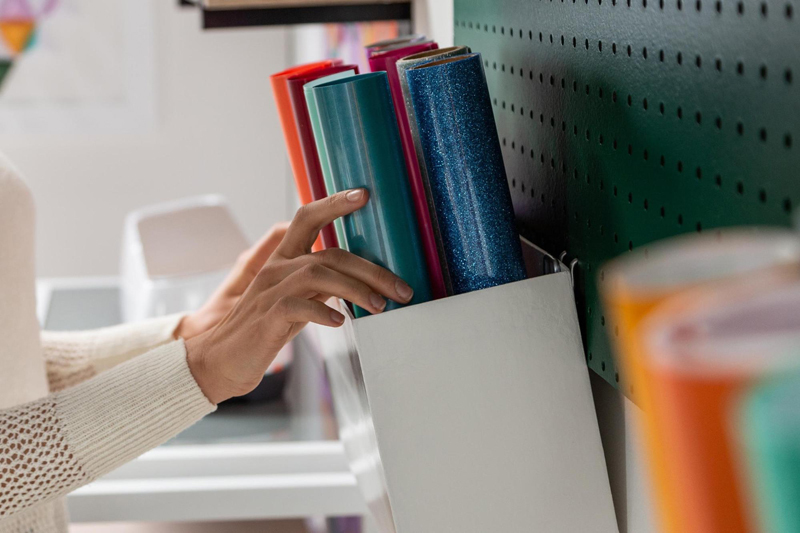 I would LOVE to see how others paint/decorate their organizers (share below in comment’s section or on our Facebook or Instagram pages…please!!!). 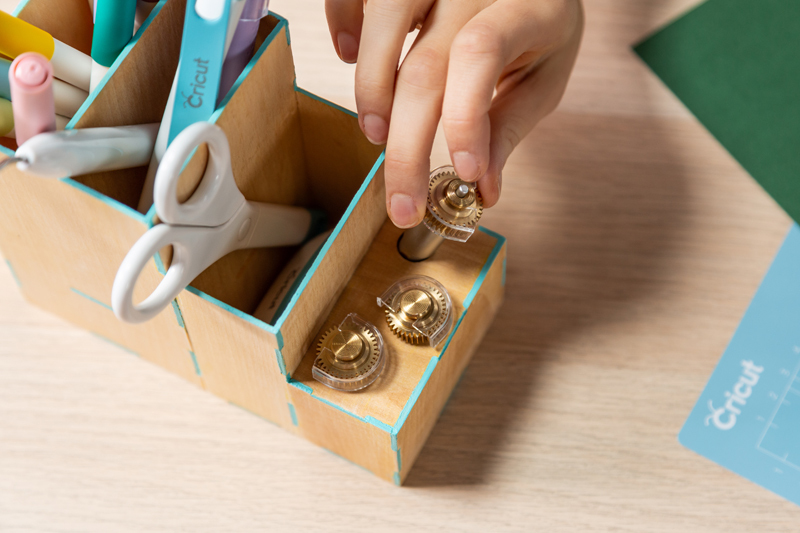 There are three compartments to store different craft must-haves. 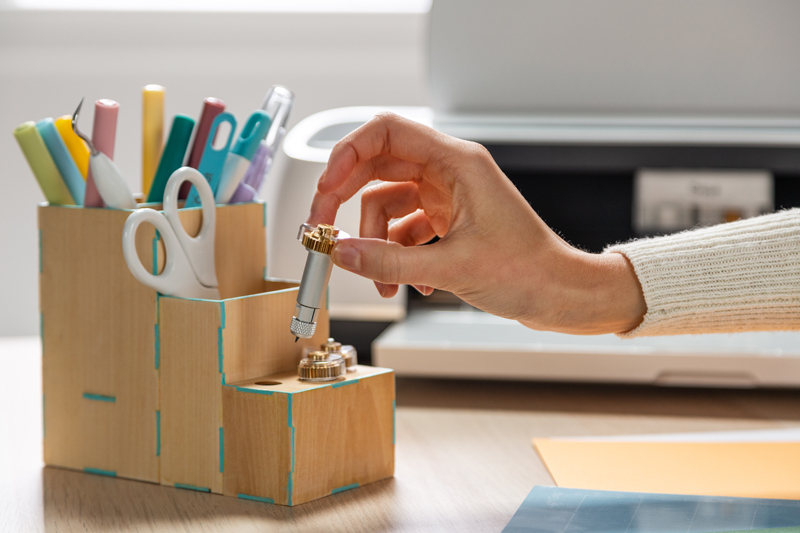 The top part is perfect for pens and/or hand tools, the middle section works great for glue gun sticks or small scissors. Then, at the base, there are three round cut-outs designed to hold my Knife Blade, Scoring Wheel and Rotary Blade. Here is an adorable (if I do say so myself) and relatively easy vinyl project that takes a generic desk organizer and transforms it into a personalized piece that compliments my craft room theme. 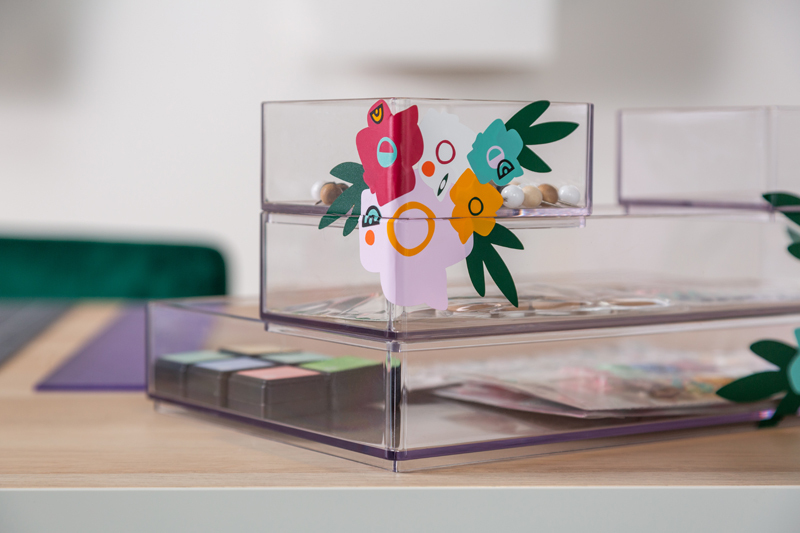 You can use either a Cricut Maker® or Explore to cut vinyl and then apply to any acrylic organizer (you can find different types of organizers online in many different configurations)! That is it! The vinyl patterns were inspired by geometric floral shapes that I keep seeing. I used Cricut’s Premium Permanent Vinyl. 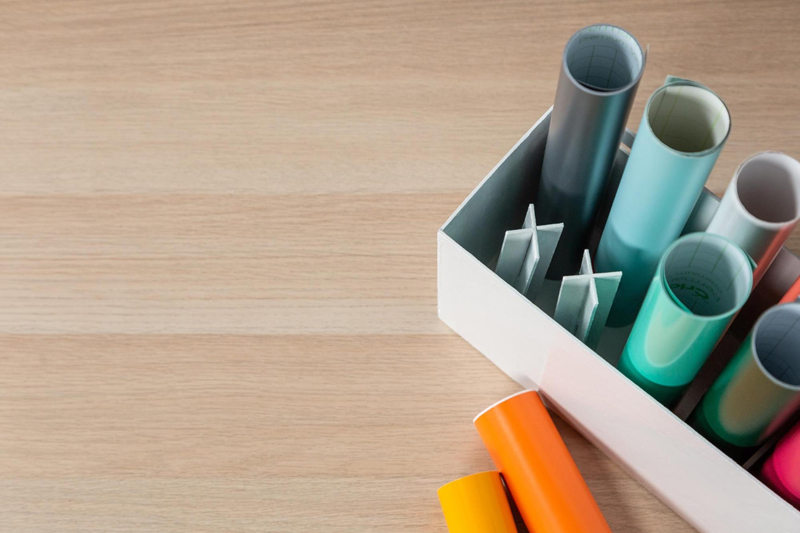 This project is for all you paper crafters out there! I have been thinking for some time about creating an inspirational sign using basswood. 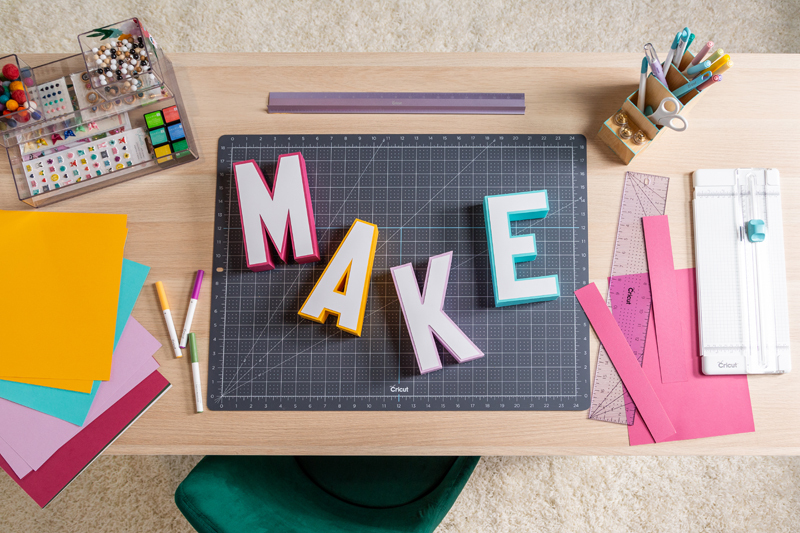 However, as I was cleaning out my space, I realized how much cardstock I had and came up with the idea to create 3D letters using my extra supplies. The project was a great opportunity to use the Scoring Wheel to create clean, crisp score lines to help with folds. These block letters would also be great for any child’s room. This project is a life saver! For years my iron-on material (also known as HTV) and vinyl sat in a cardboard box under my craft table. Seriously. This project is another one made using my Maker for my Maker materials. Using my Knife Blade, I was able to make the precise cuts needed in my chipboard and glue together the pieces to hold and organize 8 rolls of vinyl or iron-on. Add a layer or two of paint and voila! I am also considering adding some of the geometric flower shapes using vinyl to match my wallpaper. This is another project I would love to see how you would decorate–please leave comments below or share on Facebook or Instagram! For my Craft Organization Cart, I was inspired to organize my thread, ribbon, and paper (not to mention finally find the perfect spot for my new EasyPress 2 and Maker). 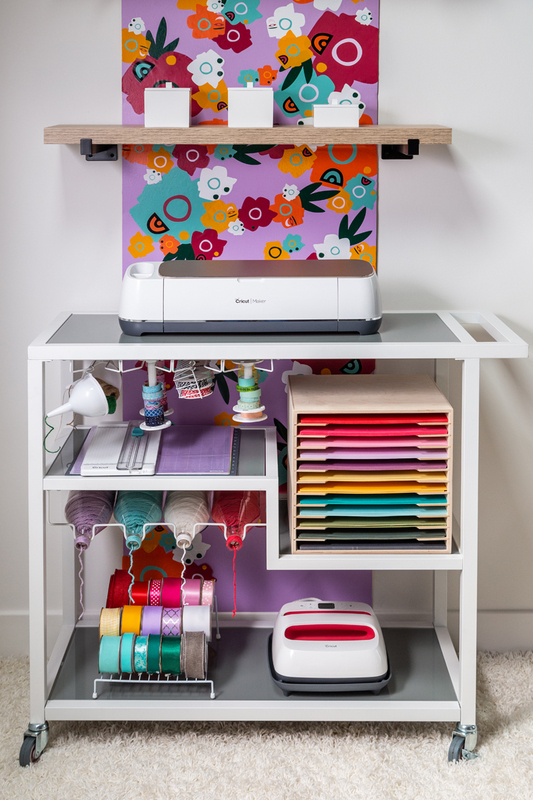 Truth be told, the cart is actually a bar cart intended to serve beverages not hold my craft supplies–a craft room would not be a craft room without some hacks. Right? There is a lot I like about my new cart. However, I am most excited about the wallpaper behind the cart. This DIY wallpaper concept can be made with any art to match the style of your studio or craft space. I played around with a lot of ideas until I arrived at abstract geometric flowers made with Premium Permanent Vinyl. I layered the vinyl and used a variety of bold colors to create the effect I was going for. Super fun project. TIP: Rather than trying to apply the images all at once, try using a medium-sized piece of transfer tape to assemble each flower on its backer. Then the completed flowers can be applied like stickers, varying their rotation and spacing for the effect you want. Sadly, sometimes my beloved Maker goes unused for a period of time and I find it covered with dust. I decided to search out in Design Space to see if there were any solutions and I was pleased to discover this ready-to-make dust cover. It even comes with a little side pocket to store small tools or accessories. 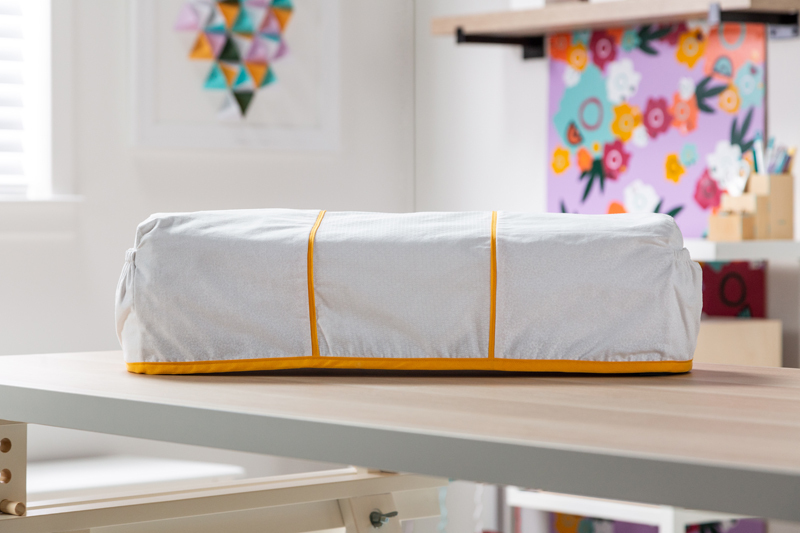 Like the wallpaper, be sure to show and tell us what designs you use for your Maker Dust Cover. I hope this blog sparks some creative ideas of your own. Leave us a comment below with ideas others can use to add inspiration and organization to their creative lives. Cheers!